Elkhorn Lake is a 54-acre reservoir in the George Washington and Jefferson National Forests (GW&JNF), owned by the City of Staunton. 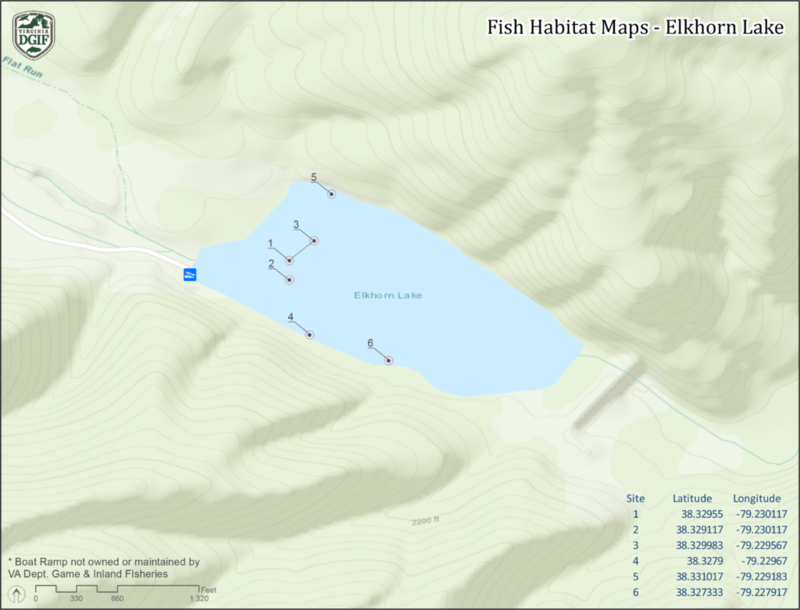 Elkhorn Lake can be accessed via Forest Development Road (FDR) 95 from FDR 96 and Route 250 west of Churchville. This lake is managed for warmwater and coldwater angling opportunities. The lake contains a quality largemouth bass fishery with good numbers of large 3-6 pound bass. Bluegill and pumpkinseed sunfish support a quality panfish fishery. Channel catfish fingerlings are stocked every year to promote better catfish angling. Trout license is required to fish these waters from October 1 through June 15. A National Forest Stamp is required. Creel limit of four fish per day was placed on channel catfish in 1997 to help create and maintain better catfish angling. A 14-inch minimum length limit was placed on largemouth to maintain an abundance of bass to help “thin out” the sunfish to promote better growth and size in sunfish. Facilities include a primitive boat launch, restrooms, handicapped access path, and fishing platforms on the entire southwestern shoreline. The Turner Ashby High School FFA worked with VDGIF to install 45 “pyramid” style fish attractors, made from Christmas trees they collected. The structures were placed in the lake in February 1999 and 2000, and they are accessible by bank anglers as well as those with boats.